Cooking School at McKenzie Orchards Bed and Breakfast. 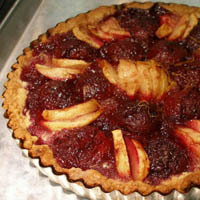 Karen and Tom Reid offer the McKenzie Orchards Cooking School at the inn. Classes are by appointment only. A minimum enrollment may apply and the teaching kitchen has seating for eight or more followed by full course theme dinners for up to 14. 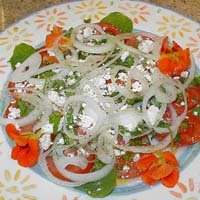 The cost per person for enrollees and their guests is $50 per person for the two-hour class and the full course meal. Wines paired with the menu are available for purchase separately. The food and entertainment are fabulous! Book a Private Group Class for great food and great entertainment. 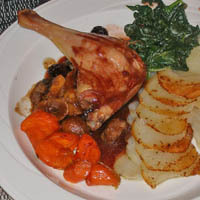 Book a Valentine Special with a class, romantic menu and B&B. Karen Reid has had a lifelong interest in cooking. Her philosophy is "life is too short to eat processed food". 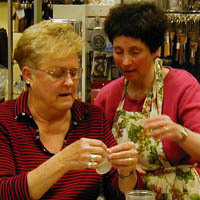 She loves to share with cooking school students her knowledge of foods, food preparation and her many technique tips to make preparing delicious, healthy meals at home easy and enjoyable. 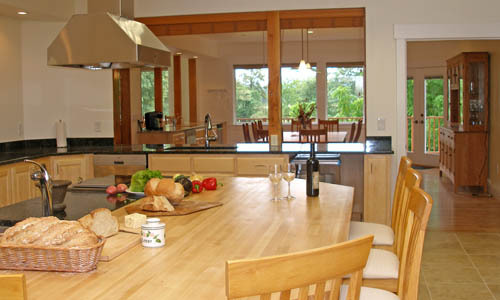 Cooking classes are held at the teaching island in the kitchen. Students join their guests in the dining room to enjoy the menu just prepared. 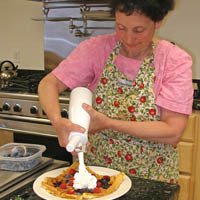 Karen has taught more than 70 classes at Pepperberries Kitchen Store and cooking school in Eugene, Oregon, since June 2003. Her repertoire is far ranging, and includes French Bistro, American comfort food, soups, Mexican, Italian, and "elegant but easy" entertaining meals.. With her husband, Tom, the "grillmaster", "steammaster" and "breadmaster", the Reids have taught grilling technique classes, breadmaking and pizza classes, and Asian hands-on dim sum and stir fry classes. 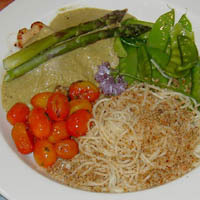 In 2008, Karen had a column in the now-discontinued monthly magazine Springfield Connection, titled "Celebrate the Season in Your Kitchen", featuring delectable seasonal full-course menus and recipes which can still be downloaded from www.mckenzieorchardscookingschool.com.